Pool Cage Cleaning is a necessary task if you live in Florida. The humid environment along with the rain produces mold and algae that grows on your pool enclosure screens , pool deck, and aluminum cage. With our pool cage cleaning service you never have to worry about if you outdoor area is going to look clean. Red Hot Services offers special maintenance plans that allow for you to have your pool cage pressure washed and cleaned on your schedule. We want you to enjoy your outdoor areas just as much as you enjoy your indoor areas. Call a pool cage cleaner that can get the job done right the first time. No matter if you have brick pavers, travertine, or concrete we can remove mold and pressure clean all surfaces. Depending on the type of surface of your pool deck our cleaning methods differ. Our technicians are trained to know how to properly clean each surface and will show you how to protect the surface so you can slow down mold growth. Our pool cleaning process is state of the are. Our technicians start at the top of your cage and apply proprietary detergents that are fast acting mold eating agents. We pressure wash your pool screens and finally your pool deck. When we see that all the mold and dirty has been removed we give your pool cage and deck a final rinse. Whether you’re interested in speaking with a professional pool cage cleaner or our sales staff about other pressure washing needs we would love to hear from. 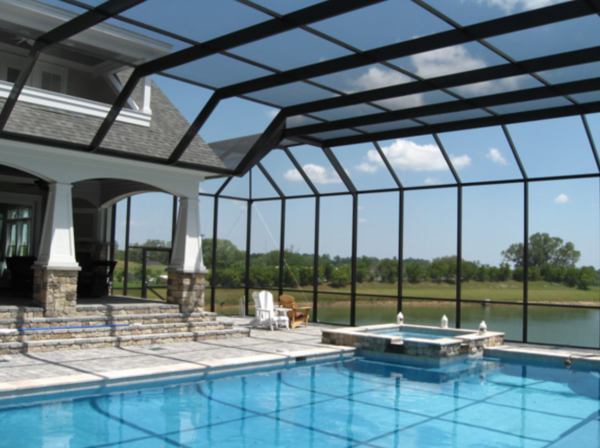 Pool screen cleaning to remove mold and debris is something that must be done regularly in Florida. Screens are delicate and should never be cleaned with high pressure. Our pool screen cleaning process uses very low pressure to eliminate mold and debris without causing any damage to your screens. Red Hot Services has state of the art equipment to handle and pool cage cleaning job no matter how big or how small. Call our professional pool cage cleaning staff today!